As I have written about before, I have a system in my classroom where students can earn their own blog. Adapted from Linda Yollis’ idea, I have found the system to work well in both my grade two and grade four classes. Recently, six 4KM and 4KJ students were the first to earn their own blogs for 2012. They join a couple of student bloggers in our class who were in 2KM or 2KJ in 2010. Teaching about and encouraging quality comments is a big part of our classroom blogging program. It is the first blogging skill we teach students and we invest a lot of time in this process. I have found that quality commenting allows the students to improve their literacy skills and engage in meaningful conversations on the blog. Teaching students about creating quality blogs and writing quality blog posts is another area that needs explicit teaching and ongoing feedback. Over a series of blog posts, I will look at aspects of quality student blogging. What makes a quality student blog post? Over the years, I have discovered my own definition of quality by working with my student bloggers. Left to their own devices, I have seen many students create posts like this. While enthusiasm is high, this is not the sort of work I’d like my students to aim for. I believe the following areas need attention. Overuse of glitter text – very tempting for young bloggers! Lack of content. I would encourage this student to either research some information about dogs or write a personal reflection on their dog. Lack of proofreading and overuse of exclamation marks. Use of unattributed, copyright image from Google Images. Limited interaction with reader (ie. they could end the post with some questions). By contrast, below is a post by Jarrod who is still blogging (in a non-blogging class) after being in my grade two class in 2011. 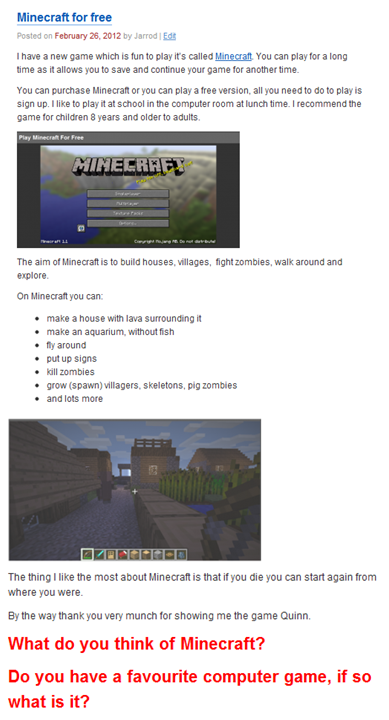 Written about a topic that interests him, and would also be useful to others (game review). Used text and images without overdoing coloured fonts or glitter text. Proofread his work with an adult and corrected most errors. Included a link to the game he was reviewing. Ended his post with questions for his readers. Not surprisingly, Jarrod received 29 comments on this post. Helping students to create high quality blog posts is an ongoing process. I don’t teach them about every aspect of quality blogging as soon as they begin. Teachable moments often occur as students travel along their blogging journey. Write posts semi-regularly such as every week or two. People might not have a chance to read posts that are published too close together. Readers might forget about your blog if you leave too long of a gap between posts. Write about something that you are interested in but also something that will interest others. I will write more about chosing post topics in an upcoming post. Reply to all/most of your commenters. Readers will be encouraged to comment again if their comment is acknowledged or if they engaged in a conversation. Don’t overdo glitter text and keep fonts consistent and easy to read. Yellows and fluro colours are generally very hard to read. If you want to use images, use creative commons images, screenshots or your own photos/artwork. 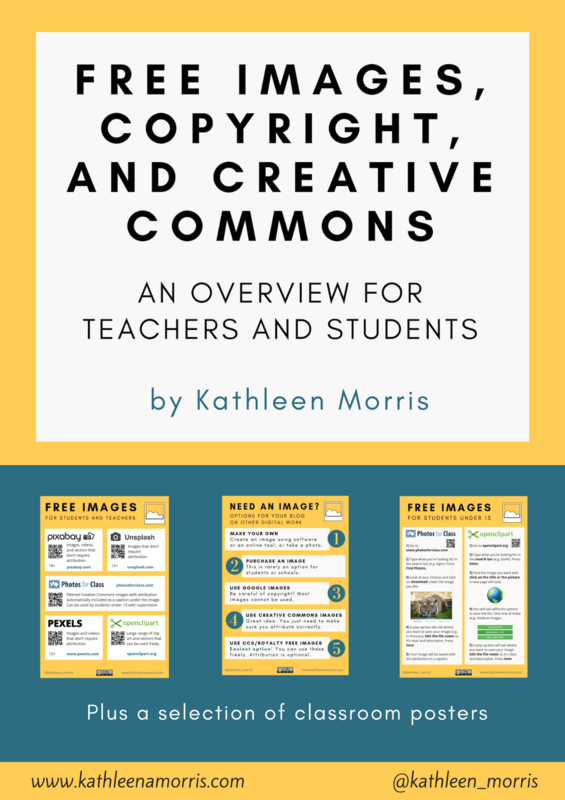 I have written about teaching students to use creative commons images here. Make posts easy to read. Left aligning text, using paragraphs, subheadings and/or dot points all helps the reader take in your post more easily. Experiment with web 2.0 tools to make your posts interactive and engaging. In the past, I have explicitly taught students about some tools and also encouraged them to find their own new tools that meet their needs. End posts with questions to provide readers with commenting prompts. Formulating questions that a variety of readers could answer is a skill that we like to help our students develop. Proofread and check your facts before publishing. One of my student bloggers recently wrote a post about my upcoming visit to the USA without checking his facts. He wrote that I was going to stay at one of Linda Yollis‘ student’s houses! This was definitely a teachable moment. What tips would you give to help student bloggers construct quality posts? Look out for my next post about quality student blogs! Thanks for another great post Kathleen. I have also been finding so many ‘teachable moments’ come from class and student blogging adventures. It places all the cybersafety and netiquette issues into such a real context. The Student Blogging Challenge was a great introduction and source for wonderful content. Excellent point about considering the audience! I was just reading a student blog post a few minutes ago and the lack of background information did stand out! If you have any other ideas of what could be added to the list, let me know. You’re right about cybersafety and netiquette. That is something we’re able to discuss authentically all the time through blogging, rather than as stand-alone lessons. 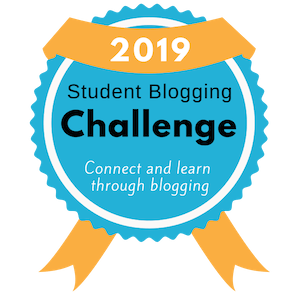 Yes, the Student Blogging Challenge is definitely worth recommending too! I’m not sure about you but I have found that it works best when parents are prepared to work on the challenge with their child. I have had a few students in the past who have really embraced the challenge with their families and got a lot out of it. I have written about the Student and Teacher Blogging Challenges here if anyone wants some more background info. Thanks for sharing this excellent post. I plan to share it with teachers and cite it in an article I am writing to get teachers excited about using blogging in the classroom. In that article, I already described the sequential story your students and students in five other schools wrote via their class blogs this spring. What a wonderful way to use blogging to connect students in all parts of the world. I have already been in contact with Mr. Avery, and he knows about the article. I will try to reach you in other ways as well to get further insights about tips for teachers in the integration of blogging and ways for them to use blogging for their students to connect with other classrooms. Thanks for your lovely comment and thanks for passing this post on. The Tale Trail was certainly a worthwhile and fun project. The students really enjoyed it and got a lot out of it. We’re currently working on a online read-aloud of the whole story. I have looked at a ton of educator’s blogs and yours is a stand-out! I hope to start blogging with my students for the first time in September and will be referring to your blog regularly for ideas and tips. Thank you for sharing your experiences Kathleen! I have found your blog quite interesting. I myself am not familiar with blogging so I have been reading more about the benefits of blogging. As a teacher for 15 years, I have been an advocated of the use of technology in the classrooms. Today’s children are technological savvy and have much interest in it. As a result of this, I firmly believe that using this method as a teaching tool will boost students, learning. I see the use of blogging as a good tool to use which can help to improve students’ language and writing skills as you mentioned above in your blog. Students given different topics to blog about would help them to become better writers. They would also be more enthusiastic to write. However, I think that when students are asked to blog at school or at home, both teachers and parents would have to monitor the content of students’blog. Thanks for the information you have given on integrating blogging in the classroom. I will surely use this tool with my students. Great to hear from you. I’m so glad you enjoyed my post on blogging. I have written many more posts on blogging which you might find interesting here. Thanks for this post. Some very good ideas here. I have used many of them but not to the degree I should have. Thanks for the good reminders as well! Thanks for this great post. There are lots of great things to consider when helping students compose quality student blogs. We too have ‘dipped’ our toes in the blogging water this Year in Year 6 as we began the process of incorporating Genius Hour into our learning. 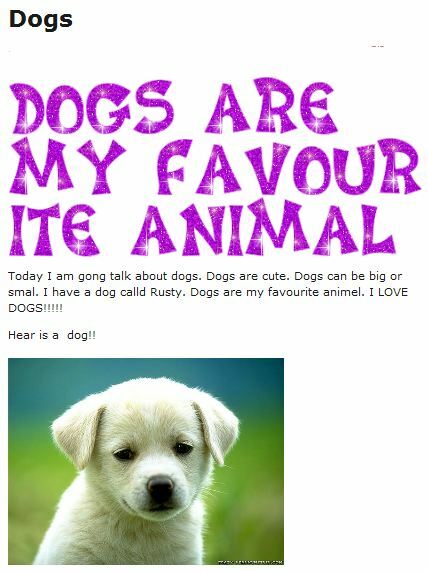 What I found when the students’ first began blogging about their projects last term (Term 3) is that they were quite basic in content and commenting. This term I want to push and challenge my students to improve the quality of their blogging and commenting. Always a work in progress as we reflect on the work of yesterday in order to move forward today.